Scandal: As Special Counsel Robert Mueller's vast and fruitless investigation into supposed ties between the Trump campaign and the Russian government drags on, it's the FBI itself that appears to have been engaged in nefarious activities. First there is the memo circulating among lawmakers on Capitol Hill regarding how the FBI went about obtaining its warrants to wiretap Trump campaign officials during the campaign. The speculation is that the memo — drafted by the House Intelligence Committee — will confirm what many already suspect, that the FBI used a phony "dossier" — which was nothing more than a factually challenged compilation of gossip and innuendo secretly financed by the Democratic Party and Hillary Clinton's campaign — to get those warrants. To hear from House Republicans who've seen it, the memo is explosive. "I can tell you I read it twice just to make sure I read it properly, and it was deeply disturbing," Ohio's Dave Joyce said. Mark Meadows, chair of the House Freedom Caucus, called the memo "troubling" and "shocking," adding that "part of me wishes that I didn't read it because I don't want to believe that those kinds of things could be happening in this country that I call home and love so much." Dave Joyce said "heads absolutely should roll," and Matt Gatetz predicted that "people will go to jail" based on what's in the memo. Democrats — and the press — are dismissing it as a political ploy to undermine Mueller's investigation and that the document is rife with errors and shouldn't be released. We won't know whom to believe until the memo is released. It's certainly possible that Republicans are overselling the findings in that memo — in which case they have made a huge political blunder — but if that were true, then why are Democrats opposing its release? If it's as bad as Republicans say, what the Intelligence Committee findings mean is that the FBI used unsubstantiated politically motivated opposition research paid for by one campaign as a pretext to spy on members of another campaign. Meanwhile, the FBI claims that five months' worth of text messages sent between virulently anti-Trump FBI officials working on the Trump-Russia probe have somehow gone missing. In a previously released batch of exchanges, FBI agent Peter Strzok and FBI lawyer Lisa Page called Trump an "utter idiot," said that Hillary Clinton "just has to win," and talked about a mysterious "insurance policy" they had in case Trump won the election. The two had been involved in the FBI's Trump-Russia investigation, and until these exchanges were uncovered, had served on Mueller's team. A new batch of texts deepens the intrigue, with one mentioning a "secret society" after Trump's victory in November, and another suggesting that the FBI needed to quickly close the books on the Clinton email investigation once Trump secured the nomination. Then there's the text where Strzok says he was conflicted about joining Mueller's team because the Russia investigation was, in his own estimation, much ado about nothing. "You and I both know the odds are nothing," he texted. "If I thought it was likely, I'd be there no question. I hesitate in part because of my gut sense and concern that there's no big there there." But here's where things really get interesting. It turns out that the FBI can't find any of the texts the two sent each other from December 14, 2016, to May 17, 2017, which was the day Mueller was named Special Counsel. The FBI says it was due to a technical glitch. We shall see. 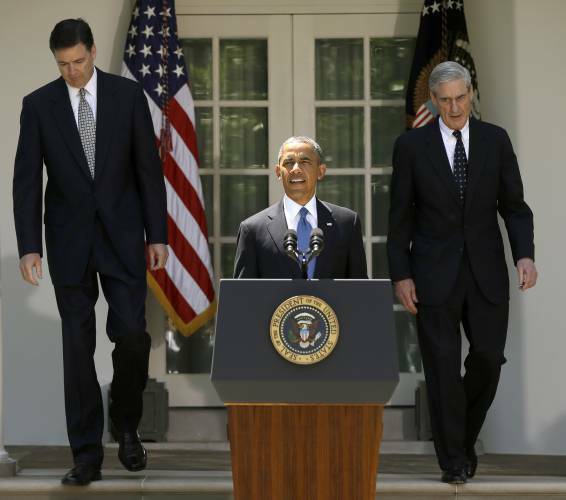 One way of reading all this is that, despite the obvious political biases of these officials, the FBI acted impartially when it came to investigating Trump, did everything on the up and up when it came to wiretapping his campaign, and suffered an innocent technical problem that erased exchanges between two key officials. Another way of reading this is that corrupt FBI officials used the immense power at their disposal to illegally eavesdrop on private citizens, fuel a costly and bogus investigation into Trump — while giving Hillary Clinton a free pass on her own scandals — and then tried to keep these machinations under wraps. We are not conspiracy-mongers here. And we, like everyone in the country, want to be able to trust that our federal law enforcement officials aren't serving as political pawns. But the facts keep pointing to the latter interpretation.